Amazingly even this little, quiet corner of the world is under the watchful eye of the petro’ industry. 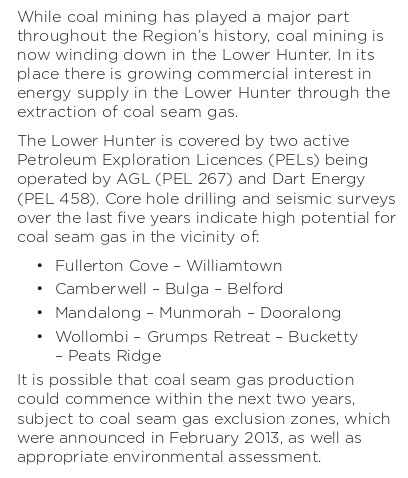 AGL holds a Petroleum Exploration License that extends from the Northern End of Murrays Run, South West to Camden. In and around Camden AGL is currently operating somewhere between 40 and 80 active wells (it seems more difficult than it should be to pin down the exact number). While the possibility of AGL or indeed any other gas company coming sniffing around Bucketty seems remote on the surface, this document published in March 2013 by the NSW Planning Department indicates that the peace and quiet might just be a piece of quiet before the storm. Recently a community action group has formed, under the convening hand of John Edye. There are fourteen of us all up on the committee, and we are in the process of organising a community wide survey to gauge the community’s feelings towards the idea of their collective backyard being turned into a gas field. I’ve written more about what I think here. We are well underway to performing the community survey, having held a fantastically powerful community meeting on June 19th. From basically a walking start only three months ago we have built amazing momentum and it is wonderful to be able to contribute to the community this way. Most of the reporting of this journey will be on the website we’ve set up. Stay tuned. This entry was posted in Coal Seam Gas, little ideas, Local events by Simonperry. Bookmark the permalink.